Should You Switch to JIO Postpaid? Should You Switch to JIO Postpaid 199 Plan? JIo introduced the new Postpaid plan on 11th May 2018 and the plan is available starting 15th May for everyone. A lot of Candytech readers have emailed me and asked if they should make a switch to the JIO postpaid plan from either Idea, Airtel or Vodafone postpaid. Also, some of the prepaid users are keen to know if they should switch to JIO postpaid, as it looks attractive. The Jio Plan hits the rest of telecom operators where it hurts most. The postpaid subscribers usually have a higher ARPU( Average Revenue Per User) and the new JIO plan brings it down further. It is beneficial for the Postpaid subscribers who will now get cheaper telecom plan not only from JIO but the incumbents will also have to reduce the tariffs sooner or later. Let’s have a quick look at the new JIO Zero Touch Plan that offers a lot of benefits for Rs. 199 monthly rental. The JIO 199 plan comes with 30 days bill Cycle and offers 25 GB free 4G Data. After you consume the 25 GB 4G data the data is chargeable at Rs. 20/GB. So, if you consume about 50 GB data in a month, 25 GB is free and for the remaining 25 GB you will have to pay 25*20= Rs. 500 extra. So your total bill will be Rs. 699 for the month. Furthermore, the plan comes with Free unlimited Voice calling for both local as well as STD Calls. Alo there is unlimited SMS access and the JIO Apps subscription is also complimentary. Also, it comes with a pre-activated ISD service and you can make ISD calls for as low as 50p/min to US/Canada. Notably, you will have to pay Rs. 99 to take the JIO prime subscription at the time of enrolling for the plan. Idea Cellular has an Rs. 389 Nirvana Plan that comes with some good benefits but it costs almost twice of JIO 199 plan. The Rs 389 plan offers unlimited local as well as STD calls and there is 20 GB free monthly data. The good thing is you can carry forward the leftover data to the next month and accumulate up to 200 GB data. Further, you get 100 SMS per day and there are no roaming charges. Additionally, you get the free subscription of Idea music which has a huge collection of music tracks, including Hindi and many other regional languages. The Airtel Rs. 399 plan also comes with a similar benefit as the Idea Cellular plan and offers 20 GB data, unlimited Voice calls and free roaming facility. Additionally, Airtel is offering Rs. 100 off on rental for first 12 months for this postpaid plan. What’s more, you also get the free one-year subscription of Amazon prime that costs Rs. 999. Effectively the cost of Airtel Plan is also close to Rs. 200 if we consider the Rs. 100 off per month and benefit of Amazon prime. The Vodafone Red Basic Plan is available for Rs. 399 and offers the same benefit as the base plan from Idea or Airtel. The Rs 399 plan comes with unlimited calling both for local and national calls. Also, there is 20 GB data that you can carry forward to the next month, and there are no charges for the incoming and outgoing roaming calls. Further, it comes with the free subscription of Vodafone play that offers free movies and music for 12 months. Concluding Thoughts: Should You Switch to JIO Postpaid? The JIO postpaid plan looks very attractive and is also cheaper in comparison to all the other three operators. Airtel, on the other hand, has started to offer the discount of Rs. 100 and even has the free Amazon Prime Subscription making it nearly as attractive as the JIO plan if you have no need for international roaming or ISD calling. The plans from Idea and Vodafone are clearly expensive at the moment and have nearly two times the price for the JIO plan. We may have to wait for some more days until these companies revise the postpaid plans to make it as attractive as JIO. Now coming to the key question, should you make the switch, in case you are on Airtel there is little difference and probably you can give them a call to sweeten your plan or ask them that you may switch. Same goes for Idea and Vodafone, which I think will revise the plans soon. Also, MNP is still a cumbersome process and may take 2-3 visits to the store, you can read my experience here. Besides, if you are unhappy with your current operator for any reason and either way want to make a switch then I think you can make it. But you must know postpaid is inherently plagued with Bill Shock issues and will continue to happen in future even with JIO. Just, for example, you accidentally use 200 GB data you will need to pay around Rs. 4000. To me, prepaid is a real nirvana take a 3-month unlimited recharge plan and stay worry-free and once it is over do a recharge again. But if you wish to be in Postpaid, I have given you all the possible details, make up your mind and if you are still confused can post a comment below, I will try to help. Below we have done a bit of study for the ISD calling and international roaming for JIO and more details are shared in the Video explainer as well. 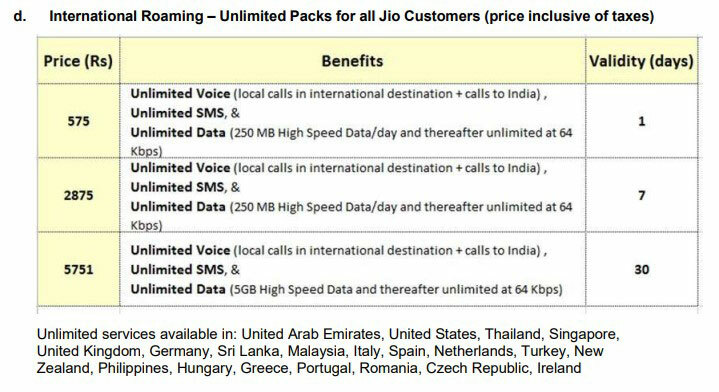 Some More Details on the JIO ISD Call Rates and International Roaming Rates? For More detailed information on the ISD and International Roaming plans if they are expensive or cheap you can watch the above video. In a nutshell, some of the countries have low ISD call rate and others are matched by the rivals, you may need to check the tariffs on specific codes in the country where you wish to call to exactly understand whether it is beneficial for you to switch to JIO. There are some countries where the International Roaming rates are low as mentioned in the below table. Countries such as UAE, USA, Canada, UK, Singapore, and Malaysia have an Rs. The 2/min rate for voice calls and Rs. 2 per SMS and per MB of data consumed. Some other countries in the table given below have Rs. 10 rates such as Australia, Greece, Germany and so forth. 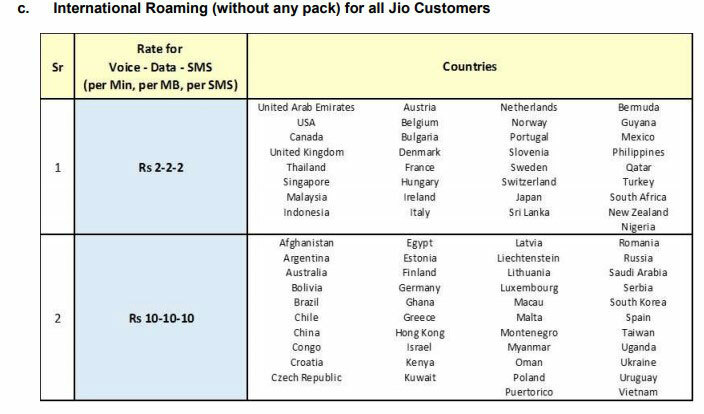 Also, there are more countries where the rates are much higher, you can check the exact rate for International Roaming on JIO for each country here.